Somewhere to store my makeup - I'm not an expert on the subject, but I'm pretty sure storing makeup over a heat source isn't a good idea. Replacing the towel rack over the radiator caused me a little trouble as the radiator is almost 8" deep and most towel racks only come out 3-4". I considered moving the rack away from the radiator, but that meant moving it away the shower which would be silly. 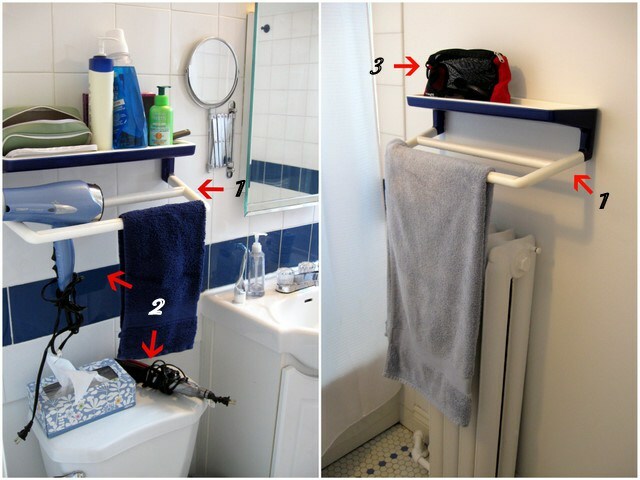 There are double bar towel racks available, but I couldn't find one I liked that also fit my limited budget. 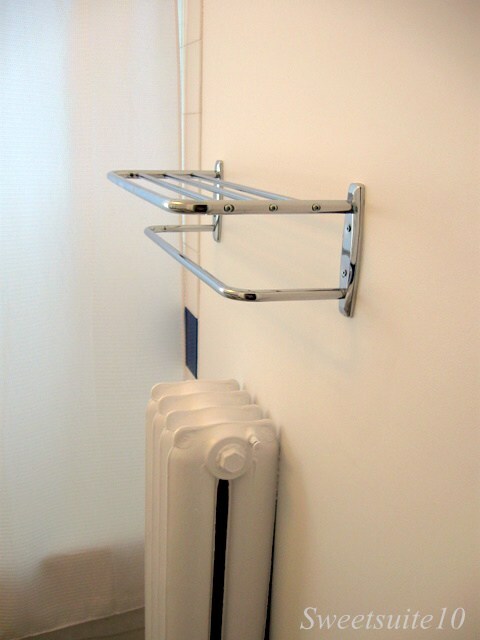 In the end I opted for a towel rack like those you see in hotel rooms. I could have mounted it higher on the wall, but I like the fact that the radiator acts as a towel warmer. Having removed the first of the two blue plastic towel racks I still needed to deal with the second one over the toilet. The original plan was the simply replace it with a new one, but then I discovered that the holes in the tile to hold my current rack were spaced 16" apart - most towel racks are either 18" or 24" long. 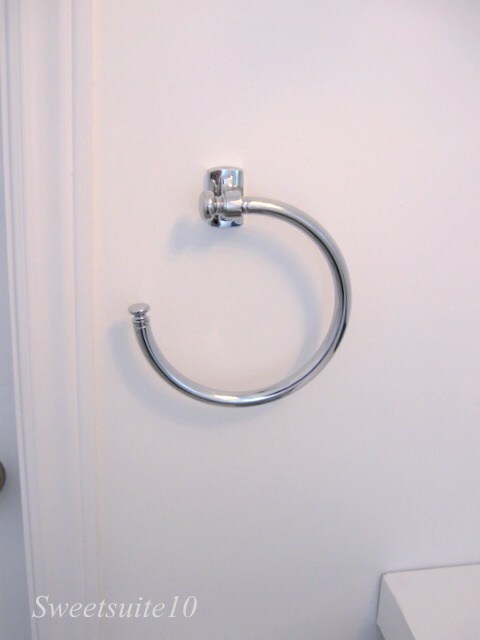 I considered drilling new holes, and also though of using a hacksaw to shorten the new bar to 16", but in the end I realised that as I was only going to use that rack for hand towels, a towel ring would work just as well. I placed the towel ring on the adjoining wall which meant there were no holes to drill in the tile. Next up was trying to figure out where to hide my hairdryer and straightener when they aren't in use. I first considered adding some hooks inside the door of the sink vanity, but this is where I store the cleaning supplies and toilet paper - two products which can go up in flames when heat is applied. While I think the chances of my hair styling tools causing a fire are rather small, I decided not to chance it. 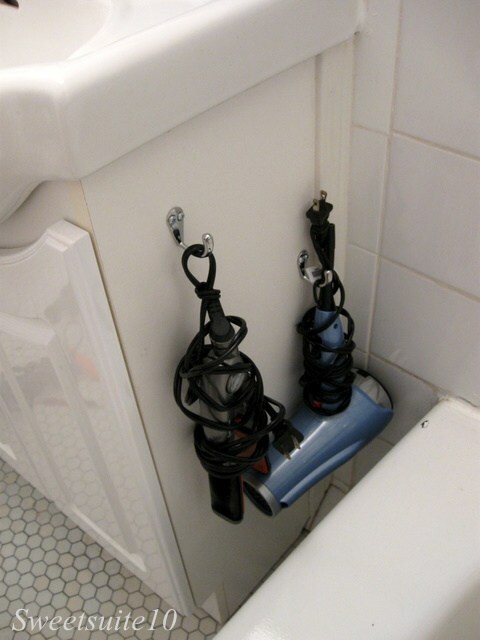 My second idea was to use an over the cabinet hook, and hook it over the rim of the toilet tank. I actually really like this idea, and I think it would have worked beautifully had I not come up for something else that made this impossible (more on this below). In the end I realised that there was a gap between the sink vanity and the bathtub which was ideal for hiding smaller items. Two inexpensive hooks later, and my tools are hidden out view, but still easy to access. The following is what I'm most pleased with in this stage of my makeover. While brainstorming about how I wanted to store my makeup (which oddly happened mostly while brushing my teeth), I decided that the ideal way to store it was in a drawer. As I couldn't modify my vanity, and replacing it was out of the question, I decided a shelf/drawer combo over the toilet would be best, and I set out to find one. This wasn't as easy as I thought it might be. 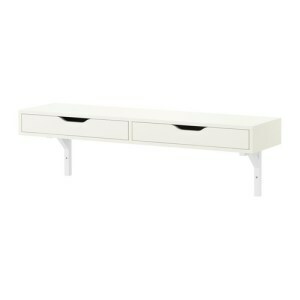 I did find something at Ikea but it was way to long for the space. This was already in the form of a drawer - all I'd have to do was build the shelf portion, and figure out how to mount it on the wall. Did you know that Home Depot will cut your wood for you? This meant I didn't have to have any fancy tools for this project - I just needed to have all my measurements ready. A word to the wise - have a calculator handy. Also, even though this is Canada and we've been using metric since the 1970's, wood is always measured in the inches. This means fractions(ick!) - if you're planing on making anything with wood brush up on your math skills. Here is a refresher of how to add fractions. The construction of the shelf was pretty simple. 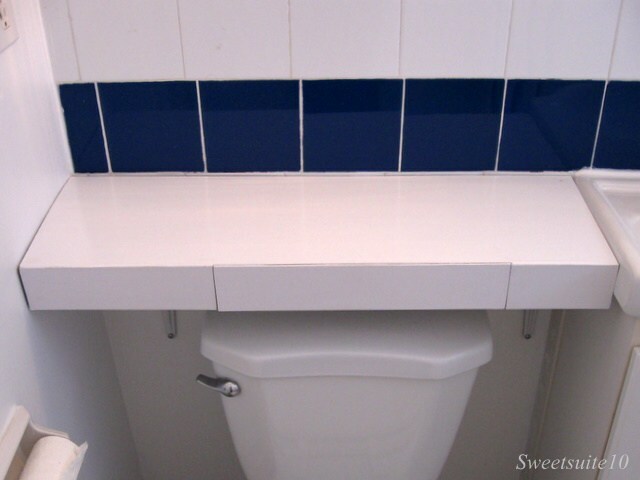 As I wanted the drawer to be over the toilet, I built two squares/rectangles that would go on either side of the cutlery tray. I then nailed the plywood to the top and bottom of the rectangles to form the top and bottom of the shelf. 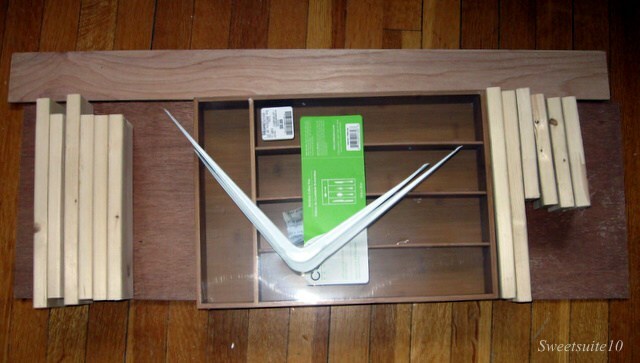 I had the guy at Home Depot also cut me a piece of plywood that fit on the front of the shelf - all I had to do was cut it into three pieces to cover both sides of the drawer and act at the drawer face. I countersunk the nails, used some wood filler and then primed and painted the new shelf (I apologise for not having pictures of the building process). The last step was to drill through my wall tiles in 4 places (two on each side) to hang the shelf bracket. I was a little nervous drilling through the tile, so I recruited my dad's help when my parents came to visit. I figured given the amount of work my parents did around the house while I grew up he had some experience. The drilling was easy and when off without a hitch. If you're planning on drilling through tile, make sure you have some water handy to cool down the drill bit. You don't need a lot, just enough to drizzle over the bit as it's working (I tried using a turkey baster, but just using my fingers worked better). When we were done my father said that he was glad to have the chance to help me as he'd never drilled through tile before. I'm glad he waited until after we were done to tell me. I popped out two of the dividers to better hold my makeup and brushes. Shelf (Home Depot, Canadian Tire, Rona, Home Sense) - $63.13, but that included the purchase of primer, a level, a masonry drill bit and a nailset - things I will use on other projects. that is so clever! 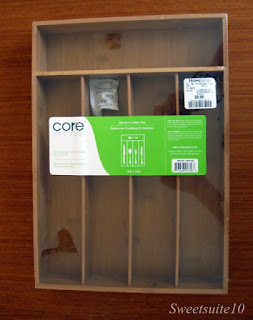 what a great idea using the cutlery tray as a drawer! 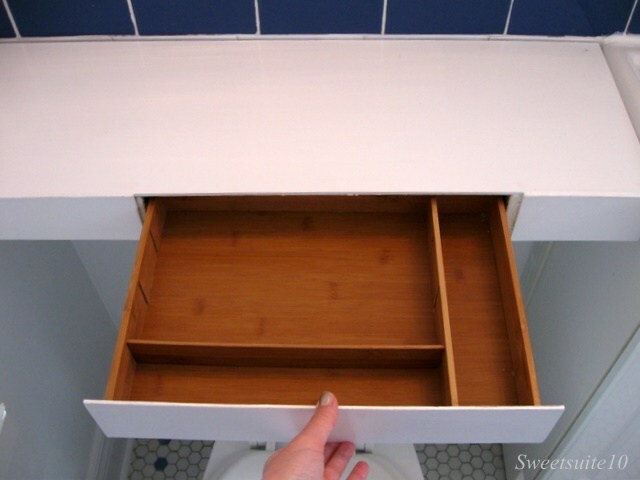 Your bathroom looks great and you have a bunch of great ideas for storage. 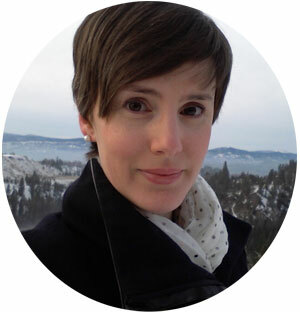 thanks for linking up to WYLTC! That's pretty cool to use a cutlery box and turn it into a drawer. I also love that Home Depot cuts wood too, it is so helpful when you don't have all the big saws! Thanks for sharing!